For just $3, To-Do List serves as a handy tool that can keep you organized in a pinch. The interface is easy to use, so it won’t add to the confusion of your day. Color-coded tasks, large checkboxes to check as tasks are completed, and a few interesting extras make this app from Concrete Software a worthy download. On My List: To-Do List helps keep you organized with task, call, and e-mail reminders in one easy-to-use app—one that lacks a professional sheen, however. To-Do List has three main purposes in life. One is to add quick reminders. You can add a task with a note—such as, remember to get groceries after work—and set a priority to the task using a slider that changes the color. (Red means get it done now.) You can then enter a due date and select a category, such as work or personal. (You can also add additional custom categories.) You then view those tasks by category, priority, due date, and title. Second, you can use To-Do List to add an e-mail reminder—here, you enter the e-mail address and a note. Say you want to e-mail your boss about a great idea. You can enter the reminder and then send the e-mail once you have fleshed out the idea more. Finally, To-Do List lets you add a call reminder. For e-mail and call tasks, you can initiate e-mails or calls your contact from the app. Of course, an app like this would benefit greatly from multi-tasking, which the iPhone does not yet support. You can copy and paste from other iPhone apps, such as Mail and the Safari browser, but you can’t run these apps all concurrently. However, being able to trigger e-mails and calls is a good way to keep you on task throughout the week. To-Do List has a rather bland interface that lacks a professional, well-designed look and feel. Fields are all different shapes and sizes, presumably to make data entry faster—but they lack consistency. Maybe To-Do List won’t set the world ablaze with its innovative interface or hard-to-live without features. It is not a project manager, nor does it pretend to be one. However, as a basic task manager with e-mail and call reminders, it gets things done. 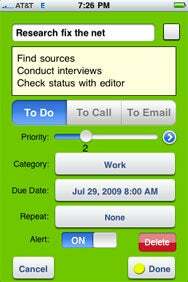 To-Do List is compatible with any iPhone or iPod touch running the iPhone 2.x software update.